herding cats & burning soup: Interview w/ Kieran Kramer + giveaway (Open INT)!!! Interview w/ Kieran Kramer + giveaway (Open INT)!!! Welcome to day 4 of Authors for the Holidays! Today we have Kieran Kramer joining us. 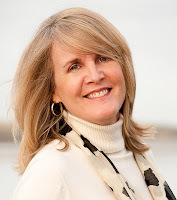 She's just a fabulous lady and writes delightful historical romances that always leave me smiling. So come check out our interview and be sure to leave her some love! She's offering one of yall a signed copy of her newest book, Loving Lady Marcia today! We've also got a review up today for her book When Harry Met Molly so hop over and check that out too and enter the grand prize giveaway ! I found your books this past summer and have really been enjoying them. I'm still all aswoon over Duncan from your latest book Loving Lady Marcia. Just *loved* that man. But for the new readers out there could you tell us a little bit about your newest series and how it came about? I woke up one night at 1 a.m. with the thought that I want to take a Brady Bunch-like family back to the Regency period. I don’t know where the idea came from. But I love the concept of having a blended family—and the cool thing is that while I pay extremely light homage to the TV show, this series is a totally organic Regency series. It’s such a delight to work with, to uncover all the things going on in this family! I always knew I was a family-oriented writer. I love the nuance of relationships—and not just the romantic ones. I loved the whole blended family as well. You really don't see that too often in historicals! Okay, so, I'm a bit of a nosy girl and am always curious what jobs authors have had over the years other than writing. Have you always been a writer? Have any odd jobs along the way? I’ve had a ton of odd jobs. First, I spent almost a decade in the restaurant industry, starting at age fourteen, when I slung barbecue pork, chicken, and ribs on plates at a family restaurant where I grew up on Johns Island. Restaurant work paid my way through college. Waitressing was my thing. I got really good at it, which is amazing considering I’m spacey and forget things easily. I’d have to remember ten things at one time, and when things got crazy busy, I had to act calm and hospitable. It’s a tough job, which is why I tip an extraordinary amount when I go out to eat. Because I remember. I remember how one amazing tip could make your whole night. And it’s why when I meet a lousy tipper, I know we won’t be good friends (unless they’re from another country that doesn’t have the custom of tipping). I also pulled pints of ale in Scotland at my university pub (I went to the University of Strathclyde for a year). I was also in the CIA and taught middle school and high school English. Oh, and I had a health column and wrote freelance stories for a section of the Charlotte Observer when my kids were small. Yes, I skipped over the part about the CIA really fast. That’s because I tend not to talk about it. It was a great experience, however. LOL. Oh my word Kieran that is just such an awesome list. Love it! Do you have any funny/silly writing quirks or a favorite spot you like to write in? I write on my walking treadmill, which has an engine designed to run at low speeds so it doesn’t burn out. My cats sleep right next to my laptop as I write. Sometimes I sit back on our recliner sofa, again surrounded by cats, and write there. But I only do that if my legs are sore from too much walking. What a neat writing set up :) Your kitties are so darn cute!! I'd love to know, what's the craziest thing that's happened to you since you've become an author? Best thing? The best thing has been pleasing my readers. It makes me very happy to do that. Oh I bet it does get crazy some days! Is there anything your readers might be surprised to know about you? Hmmm, I grew up on a rural sea island and helped clear my family’s land and build a house on it. For five years, before the house was finished, my bedroom was a small camper trailer I shared with my sisters. Whoa, that's pretty neat! When you're not immersed in the world of writing do you have a favorite way to spend your time? Heck, yes! Reading!! That’s my number one favorite occupation, and then watching my few TV shows, playing piano, taking walks with Striker and my husband, playing with the kitty cats, talking on the phone with my sisters, and visiting my parents and sharing a cup of tea with them. Aw that all sounds wonderful! So, I'm a big fan of the holidays. Any exciting plans or traditions your looking forward to this holiday season? We have family coming in—that’s always exciting. One thing I love is that on Christmas Eve, at my parents’ house, we jump on a haywagon and go caroling to all the neighbor’s houses. I also love holiday baking and decorating the tree. Christmas music and movies make me very happy, too. LOL That sounds like a blast! Hope yall have a great time with it this year :) I bet those kitties are ready for their mamma to come pay them some attention so how about a quick lightning round before we let you go? Favorite guilty pleasure?Watching singing reality shows like The Voice, the X-Factor, and American Idol. But I feel even guiltier about watching a truly raunchy show, The Real Housewives of Beverly Hills, which I love! Coffee or tea? Tea!!! I’m mad for tea, but I’m not very creative about it. I like black tea with milk. Homebody or social butterfly? Oh, SUCH a homebody. Favorite holiday? Thanksgiving. I love everything about it, especially the pie. Favorite book? I Capture the Castle is a biggie. I don’t have one favorite. I feel as if I’m betraying my other favorites to name just one! Thanks so much for taking the time to stop by herding cats & burning soup Kieran and for being my first official interviewee (even if yours didn't get published first lol) !! It was great chatting with you :) Have a wonderful Christmas and New Years! USA Today best-selling author and double-Rita finalist Kieran Kramer writes Regency historical romances for St. Martin’s Press. If You Give a Girl a Viscount, the fourth and last book in her Impossible Bachelors series, is on sale now. Her new series, House of Brady, premiers in August 2012 with Loving Lady Marcia. A former CIA employee, journalist, and English teacher, Kieran’s also a game show veteran, karaoke enthusiast, and general adventurer. Kieran is offering a SIGNED copy of her latest book Loving Lady Marcia & some swag to one lovely follower today! Leave her some love and fill out that Rafflecopter! Then be sure to check out our REVIEW for entries in the grand prize giveaway! I just love big family oriented book series, set in any time period at all. Taking the Brady blend to the Regency period sounds like a fun read. So, can we expect at least 6 books in the series? Yes, Kathryn, and you can hear the title of Book 3 here at Anna'a blog first--SAY YES TO THE DUKE! Book 2 is THE EARL IS MINE, out in February. Great interview! Thanks for sharing the blurb...this sounds like a wonderful read! If it were up to my 3 daughters we would keep every one of them. This book sound great and i like the cover book, all PINK!!! LOL!! i love kieran's books..i collected them!! can't wait to read about lady marcia..
Aw congratulations on your surprise! That's amazing!! Sounds like a fun book.Nice post.Thanks for the chance to win. Ahhh Miki sorry hun! That was totally my fault. I forgot I put that in the rafflecopter "rules" section. It IS INT (had started out US only but I have the books at my house now so it's int)! So enter away :) I'll shoot you an email just in case you miss this. Anna, i can't tell you how happy i'm, thank you so so much you are really wonderful thank you! Hope you enjoy the rest of the month!! Anna, I'm so happy to be here today. You are such an awesome reader and blogger friend! I hope you and your readers all have a fabulous holiday season filled with tons of great books to read!! Hope you and yours have a fabulous Christmas and New Years as well!! PS- You totally got your spice going on in When Harry Met Molly. Whew that was an excellent scene!! Thank you for the holiday good wishes and for the compliment on that scene in When Harry Met Molly! Are you talking about the tent scene? I loved writing that one, LOL!!! LOL Yep! That's the one :) The whole thing was really great. Same here Aly! My favorite is a blackberry sage. It's so good! Haha, Aly, tea is my favorite beverage!!! I drink it all day. Thanks for the sweet words!!! Can't wait to read about the Brady's, is Alice there as well??? Sheila, Yes, Alice is in the books! In fact, right now, there's a little Christmas scene about Alice that I wrote over at Rita & Dani's blog event. I also got a little bit of Duncan and Marcia in there from LOVING LADY MARCIA!! Hey Kieran! We had a question for you end up over on the review of When Harry Met Molly. Penni was wondering...What makes you want to write historical romance over other sub genres? You are woman after my own heart! I loved Jane Austen, Dickens, and Twain! I was always told growing up that I was too old for my years because I would read classics instead of whatever book was the fad with my age group at the moment. You do write amazinf characters, so easy to fall in love with and read over and over again! LOL!!! I DID come home kicking and screaming! I wanted to stay in Scotland. My favorite place was the Highlands, and I'd have to say the little town of Ullapool caught my fancy very deeply. I love Scotland SO much. It's part of me now--I spent a whole year there. I lived and I loved there, so I'm an honorary Scot. I cried all the way from Glasgow to London, where I was to catch my plane home. You write such fun and clever books. I can't wait to read Loving Lady Marcia. What a fun interview. I learned a lot about Kieran (love the name),who is a new author to me! Of all your jobs, Kieran,which has been your favorite? HI, books4me! Thanks for the compliment on my name! Which is real, by the way, and very common in Ireland as a boy's name (It's like being called Bob or Fred). My favorite job has been becoming a working writer. I prefer to call myself writer versus author because we are all writers together, whether we are published or not. But I also loved teaching and think I was born to be one and to mentor teens and middle schoolers. So someday (when I get a moment's rest, ha!) I'm going to write for them, too. I ADORE people that age. Kiernan's books are so much fun - she has a great sense of humor which really comes thru in her characters. Thank you, dahling!! You're kind to say. My family thinks I'm the least funny of all of them. Little do they know, I only ALLOW them to think that. I set up so many jokes for them, and they have no idea! I'm a typical mom...we just wink at other moms and go on letting the family believe we're just moms. LOL!!! We're so much more, aren't we? I think Loving Lady Marcia and the whole idea of the House of Brady series sounds fantastic and I'm looking forward to reading the whole series. This is one of my favorite covers this year! The book sounds great too! I like that you write on a treadmill. What a great way to stay in shape. I look forward to reading all about the Regency Brady Bunch! My cats like it, too. Their eyes start to sparkle when I get on the treadmill. I think they think it's a great beast that they'll slay--someday, when they get up the nerve! They'll jump on the desk portion of it and look down at it as if they're contemplating that idea. But they're too afraid to (thank goodness), so they curl up and sleep instead. LOL!! I'm really interested in reading The Earl with the Secret Tattoo. It's a great title with a great cover. How did you get the idea for the story? I can't imagine writing while walking. It sounds quite difficult, I'm such a klutz that I'd probably fall and break something. I love that your kitty likes to be with you when you write. Kittie Power!! Yes, Kittie Power!!! I walk VERY SLOWLY, at 1.6 miles per hour. And thanks for the lovely words--I got the idea with my editor. We were having lunch and came up with it together. We liked the idea of a gentleman walking around with a secret tattoo that the heroine sees!!! Kieran Kramer is a new author for me! Oh, I've heard lots of good things about her books. I just haven't had the pleasure of reading one yet. I will have to do that soon. SouthernGirl, I hope you do! Thank you! I live in the South myself--in South Carolina, near Charleston. It's a great place to be!! Nice interview and still I hope The Earl with the Secret Tattoo will available in print version. Congrats on the release! 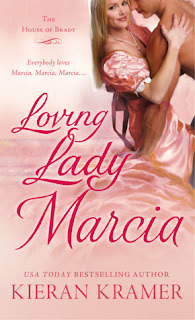 I can't wait to read "Loving Lady Marcia". And am looking forward to the upcoming releases. Thank you, June!!! I hope you enjoy the House of Brady series!!! 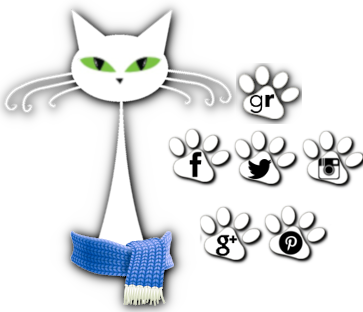 Thanks again for hosting me at your wonderful blog, Anna. I had such a good time, and I loved your questions. Your readers rock, and you should be super proud of the community you've brought together on such a nice site!!! Merry Christmas, and Happy 2013!!! And if anyone celebrate the Festival of Lights, Happy Hanukkah!!! I love the cover and very interesting description of the story. Thanks for the giveaway. Wow, you sure had a lot of jobs, and I agree, I always do tip well in restaurants. At least, if the service deserves it ;) If not, they will hear about it as well. It can ruin your whole evening out. Thanks for the chance to win a signed book, I love those and treasure them. I have a whole shelf of Kieran that I started out buying simply because of the titles and covers!! LOL I know, maybe not the best way to use a limited book budget. But in this case, it worked out well. I love clever titles and the stories that go with them!! I love series especially when there is a big family and you get to revisit characters!! I loved your When Harry Meet Molly and the other books (memory not bringing up the titles! )in that series! Very funny! Def on my authors to watch list! I'm definitely eager to read all of Kieran's books, my friends keep telling me I HAVE to! Great interview! I love that you and your family goes caroling. I kind of wished that people around here did that. As long as I have been alive, I have never seen people caroling in person. I am an animal lover myself and my dogs lay on me...all 3 of them. Lol! And if the 130 pound cur can, he does too:) he is very jealous and I cannot have my others around him. What a fun interview. Enjoyed reading it. and adding the The House of Brady to my Fav Families. Thanks for sharing a bit of your self with us and the giveaway. I have had Loving Lady Marcia on my list of must buys for a very long time, but with Christmas presents for 6 children to cover, it's still on my tbb list :-( Thankfully, once Christmas is over with and all of the kiddos have their needed accessories to all of their gifts then I can finally catch up on my book buying :-) Merry Christmas to all! Hi Kieran! I own all of your books and I love them all! I can't wait to read your next one. Merry Christmas! I've got The Earl With The Secret Tattoo on my kindle, waiting for me! Your books sound interesting, really want to read them. But I have to say that our cats might be relate. My cat is so attached to my lap that she will actually follow me around the house when I'm cleaning or exercising and yell (meow) at me to sit down so she can have her lap back! And both cats will follow my hubby around (at different times) to keep an eye on him- 1) to make sure he doesn't drown in that strange room with the water leak (bathroom), 2) remind him that the Cat Gods must be given treats whenever a pet (human) walks by the container, or 3) to tell him it's time to go to/get out of bed. My hubby thinks that they are trying to communicate to other cats when they walk on the computer while we are on the internet...I still think they are just trying to control how much time we spend NOT paying attention to them. I have not read these books yet but they look so amazing <3 I hope to pick up this series soon the covers themselves are swoon worthy! Loved the interview. The covers on these books are gorgeous! I started reading years ago with historical/regency romance novels. Think it's time to start getting back to them. Thank you! Awesome interview! I'd totally wanna be Elizabeth Bennet too, mostly for the Mr Darcy side of things XD And Loving Lady Marcia looks really cute!! Just wanted to let you know how much I loved reading Loving Lady Marcia and The Earl with the Secret Tattoo! I can't wait to read The Earl is Mine and always enjoy finding out more about you in your interviews! Hope everyone is feeling better at your house! I havent read a lot of Regency stories. But I love the idea of taking a Brady Bunch family and putting them in that period.